Increase the graduation and the qualification rates before the age of 20. • Increase our graduation and qualification rate after seven years from 74.4% to 78 % by June 2018. • Decrease our number of school leavers without a diploma or a qualification (dropouts) from 104 students to 85 students. • Decrease our rate of school leavers without a diploma or a qualification (dropout rate) from 22,8% to 18.5%. The following tables present the data available. 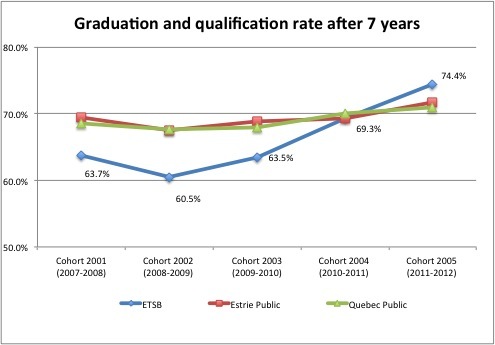 The rates provided by the ministère de l’éducation, du loisir et du sport include students moving outside the province of Quebec. Therefore, the Eastern Townships School Board calculates an internal rate by removing these students.